Kidney and ureteral stones are very common in India. About 1 in 10 people get them some point in their lives. Lifestyle and diet are believed to be the major factor in causing stones. It is a painful and discomforting condition that is more often found to affect males as compared to females. For many fortunate people, the stones pass through urine and go out of the body. However, some people need medical interventions to get rid of kidney or ureteral stones. Human urine contains minerals and acid salts. Mostly these exist as dissolved substances but sometimes, they may get crystallized and accumulate as hard solid mass which fails to get secreted by urine. Stones formed in the kidneys are called kidney stones and when move and leave kidneys to reach ureters where they get stuck and block the normal urine flow, they are known as ureteral stones. Cystine stones which are related to hereditary problems. Struvite stones which are caused by urinary tract infections. Kidney and ureteral stones can occur to anyone. Under normal circumstances, kidney maintains a chemical balance in urine but some factors trigger formation of stones. High-protein diet increases the acid content of the urine, making the stone formation likely. When the body absorbs more calcium from foods we consume, a condition called absorptive hypercalciuria, also results in stone formation. 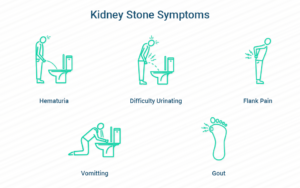 What are the symptoms of kidney and ureteral stones? Stones of very small size generally pass in the urine without causing any worry. These are known as ‘silent’ stones. Kidney stones cause hardly any symptoms when they are growing. As they become bigger and move around, the symptoms began to surface. Sometimes, there is a dull pain in the back which most people think is due to a muscle pull but is actually due to a small size kidney stone. If you experience any of these symptoms persistently, then contact a urologist without further delay. If a person complains of severe pain or blood in the urine, then doctor will ask for an x-ray or sonogram. The diagnostic images will reveal the size and location of the stone. If the doctor is unable to make a complete diagnosis, he may suggest computed tomography (CT) scan of the kidney area to get the clarity and confirmation. Blood and urine tests may also be done to find out the underlying reasons for stone formation. Kidney and ureteral stones are recurrent in nature which means those who develop stones at one time are at risk of getting it again – the chances are almost 50%. The best way to prevent stone formation is by drinking lots of water throughout the day. This will keep excess substances in dissolved form as much as possible. If high calcium content is the reason for stone formation, then one should avoid calcium-rich foods such as dairy products including milk, curd, cheese and buttermilk. The treatment of kidney stones depends on the size, location, number and composition of stones. Doctors also consider your personal preference and medical history. More conservative treatment involves giving medication to allow stone to pass through the urine. Smaller stones located closer to the bladder are easily passed in the urine within 4-6 weeks. If the kidney and ureteral stones are causing severe symptoms, then more active alternative treatment options are considered. These are Shock Wave Lithotripsy (ESWL), Ureteroscopy (URS), Percutaneous nephrolithotomy (PNL) and Open Surgery. Shock Wave Lithotripsy (ESWL) uses a machine ‘lithotripter’ to create shock waves outside the body and then pass them through the body to hit the kidney stones and break them into small pieces which can eventually pass through urine. It is a non-invasive treatment done on outpatient basis. Patient can go home immediately and resume normal routine. Ureteroscopy (URS) uses a fibre-optic device called ‘ureteroscope’ to see and grasp the stone into a mesh-like device. It is then removed out of the body. It is an endoscopic technique and requires no incision. After the procedure a stent may be placed in the ureter to prevent any swelling or inflammation. Patient can go home. Rest is needed for at least 2-3 days before one resumes normal activities. If a stent is placed, it will also be removed after 1-2 weeks. Percutaneous nephrolithotomy (PNL) is generally done for large stones located at the centre of the kidney which makes them inaccessible with ESQL or URS. The procedure is done under the effect of anaesthesia. A small cut is made to allow a wire to pass into the kidney and directed towards ureter. Stone is seen using a nephroscope and is then broken into smaller pieces using laser beam. Vacuum suction is used to remove the stone fragments. Patients have to stay in the hospital for at least 24 hours under observation before allowed to go home. Normal routine can be resumed after approximately 7-15 days.